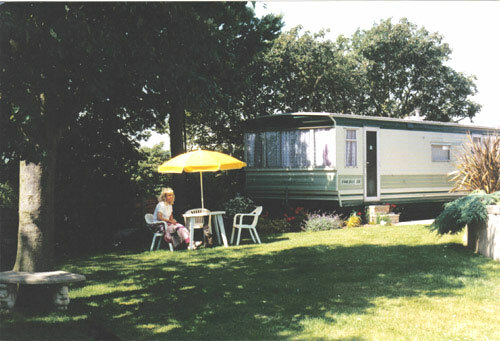 We just have the one comfortable 28ft long ‘Torbay’ caravan just to the rear of the guest house, adjacent a lawned garden area and overlooking Harwood Dale. It has a lounge (with freeview television/DVD and dining area, two bedrooms, one with a double bed and one with two single beds (these could be made into a double bed if required), there is also an overhead bunk in this bedroom if required but this is not recommended for adults. The dining seats can be converted into a double bed if required. Duvets, pillows and linen are supplied. Although the caravan is technically described as an 8 berth, we have fixed a limit of 5 people maximum. The bathroom consists of flush toilet, shower/bath and washbasin. There is an electric convector heater (with fan) in the lounge which can be controlled by thermostat. We also have thermostatic convector heaters in both bedrooms. It should be noted that although the Guesthouse has been awarded a 4 Star rating, the caravan is not included in that assessment. We do however maintain the same efforts in quality as the guesthouse. In the kitchen area there is a gas oven and hob, a small microwave oven, washbasin with hot and cold water and a refrigerator. We supply crockery, cutlery, toaster, kettle and cooking equipment, but as it is self-catering please supply your own food and toiletries. Clean towels are available. Gas for cooking/water heating and all electricity is included in the price. Please note that Harmony Country Lodge guest house is licensed to sell alcohol if you wanted to come into the house for a drink. Full English Breakfast including fruit, cereals, toast and beverages can be provided in the house at £6 each. This is by arrangement the day before required. There are three good local pub/restaurants within one mile should you wish to go out for an evening meal. As we are a quiet retreat we prefer adults and children 5 years and over. Should you require the use of a telephone, there is a payphone in the house. There are good supermarkets (Proudfoot and Tesco Express) about two miles away towards Scarborough or other top supermarkets Sainsbury’s, Tesco, Morrison’s) in Scarborough. In Burniston village there is a Post Office and Newsagent also selling food etc. We have our own private car park which is about 20 meters across the lawn from the caravan. DOGS: Please note we do accept well-behaved dogs by prior arrangement and recommend a limit of one medium/large dog or two small dogs. Because we have cats and wildlife, we ask owners to keep their pets on a lead in our grounds and ensure they are well behaved. There is a ‘doggy-walk’ just outside our entrance but please be aware of the usual bylaws concerning dogs and make sure you clear up after your dog. There is a bin for this use. There is a £10 supplement for the inclusion of pets. Please note it is against the law to smoke in the caravan. Click here to see the terms & conditions of booking.